I have not read this book. I do not plan to read this book. It’s too depressing to read about Eventing when the closest I get to a cross-country course is the pictures in the book. Maybe some day. Meanwhile, Phillip Dutton is an accomplished rider and Amber Heintzberger is an accomplished writer. I have no doubt they created a great book. I have asked her to tell us about the writing of the book. Welcome Amber. I was spending the afternoon watching the camp at Phillip’s farm, and he mentioned that he was interested in writing a book. I said, “I could help with that”, and we ended up putting together a proposal and sending it to the publishers at Trafalgar, who also published Beyond the Track, which I co-authored with Anna Ford [Trafalgar Square 2008]. We ended up postponing the project because I was pregnant with my daughter, and then we decided to wait until after the WEGs. I had actually just found out I was pregnant with my son when Trafalgar emailed and said they thought it was a good time to get started on the book, but I figured we’d better get on with it and we got to work. Unfortunately with so much material, then the fire at True Prospect Farm in May, and then Phillip preparing for and competing in London the next year we weren’t able to finish the book before William was born, so that made things a little more complicated for me – especially because he was a really colicky baby who spent most of the first six months of his life screaming his little head off. But Phillip was a good sport and woke up before the sun almost every day so we could talk – usually from around 5:30am until 7am. William was most quiet when I wore him in this thing called a Moby wrap, so I’d bundle him onto my chest, bounce on an exercise ball, and get some writing done, while my daughter entertained herself drawing pictures and playing with her toys. I’d been pretty strict about television before I worked on the book but I finally caved – she watched a lot of “Caillou” during the writing process. I also found a couple of really great babysitters to help with the kids, but since NYC babysitters don’t come cheap, I tried to get as much work done as possible on my own time. I also ended up wearing William in a baby carrier when I took the photos at True Prospect Farm, and since the shoot went all day I had to feed him – being a dad, Phillip barely blinked when I discretely nursed William WHILE I just kept on shooting photos. Ryan and Jennie, who were riding for the photos, were good sports as well! Baby carriers are great for keeping your hands free to work while you’ve got a little one in tow! Another interesting thing is that Phillip does NOT type! In the beginning he scribbled about 20 pages of notes and faxed them to me, but trying to decipher his handwriting and turn the notes into something readable was a cumbersome process, so we started talking on the phone instead, with me typing as he talked and asking questions when things needed clarification. Phillip is great at explaining his methods and this was a lot easier for both of us. I added information here and there, but I think his voice really came through thanks to this method. The photos were a big project. I took a lot of the grooming photos during Jersey Fresh, and the training photos at TPF, and competition photos at Fair Hill. I also had photos of Phillip in my files that I used. I took the photos, sorted them, chose the ones that worked, renamed them according to where they would appear in the book, placed markers in the text that coordinated with the file number, and wrote all the captions. It was extremely work-intensive if I swapped out a photo or added something later. However, the photos were an important part of the project. What is an instructional book without visuals? 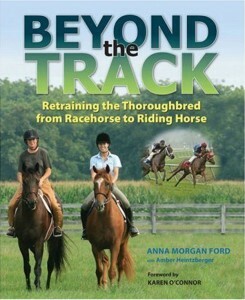 Overall I’m pleased with how the book turned out, and it seems to be well-received by the eventing community. There are a lot of great books out there, but this one really covers it all and has a lot of current, up-to-date information that is important for riders who are interested in eventing. (Back to RS) Amber’s first book appeared in my book column for US Eventing. I made her do her the heavy lifting there as well. Further book information at New Vocations. For those interested in meta issues, although I don’t plan to open the book any time soon, I obtained Modern Eventing for my library. It is not a review copy. I bought the sucker. Since I can no longer deliver a significant venue, I don’t feel right asking publishers for free books. Boy, do I miss that.